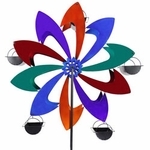 Without exception, our spectacular line of Ferris Wheel Bird Feeders (a.k.a. “Ferris-Feeders”) have remained the most exciting and best-selling birding item that we at GardenFun have ever seen or carried. The original design back from 2008 always sold out like crazy and we could barely keep it on the shelves. Unfortunately, that version was was discontinued because it was bulky, heavy, and expensive to produce. Recently though, through the help of new manufacturing techniques, tooling, and hundreds of encouraging emails pleading for us to bring the item back, we were able to reintroduce the newest Ferris Feeders, and this time it comes in multiple styles and finishes. 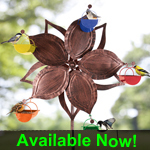 With the New Patent Designs, these feeders have been flooding the yards of birding and garden enthusiasts nationwide, and the verdict is in: Everyone LOVES THESE BIRD FEEDERS!! Incredibly fun and functional for the birds too! Looking to purchase a unique birding or backyard garden gift for yourself or a friend? The Ferris-Feeder by Exhart is the most exciting birding item we ever carried. 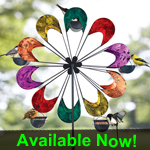 Now finally back in stock with beautiful New designs, watch these amazing Ferris Wheel Bird Feeders spin colorful motion into your life and garden! 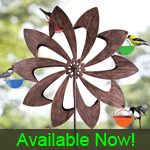 If you're searching for an incredibly unique garden gift that combines the hobbies of gardening and bird watching, you MUST ABSOLUTELY get one of these Ferris Wheel Bird Feeders! You will LOVE it, Guaranteed ~ and the birds love them too. Color, Motion, and Fun in your garden! Watch Video of The New Ferris Feeders in action! 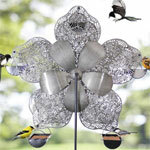 Like works of art standing tall in your garden these fabulous Ferris wheel bird feeders are beautifully symmetrical and aesthetically pleasing. They are also carefully thought out and functional in design. While this item might look like a fancy wind spinner, it actually is not intended to move with the wind. It is not propelled by any type of solar power or motor either. The wheel of the design is actually balanced to remain still. It is actually the weight of the birds that get the item into motion! As the birds land on the Ferris Feeders, their weight starts to push one side down. Depending on how the birds continued to feed and fly off and land on the wheel, the feeder will start to gather speed and possibly even change direction with multiple birds. In all, the motion is controlled as to not startle the birds from the feeder, and because of the smooth increase in speed, you can often find birds simply eating away and taking a ride around without a care. So, what you end up getting is a beautiful bird feeder with color and motion, and multiple feeding ports, and some frolicking and joy riding birds. Depending on the number of visiting birds, there can be plenty of birds feeding at the same time with a lot of excitement. The removable feeder cups all have drain slits in them for the moisture or rain to seep out too. They swing back and forth so they are perfectly balanced as well as the feeder goes around in a circle so the seeds do not fall out.